Notice how there are no I’s or me’s in this prayer?? It never struck my “see chord” much over so many years of repeating and reviewing this prayer. I did, what I believe most do, assuming Yeshua (Jesus) was addressing the disciples (many) and thereby using the us’s and we’s so as to include all (including all who would read later). Yet as I was led sometime ago to sit at Yeshua’s feet over each word; being taught anew to redefine them and remodel my mind to their keeping; something more seemed to be emphasized. Looking over Yeshua’s words in general, especially in the book of John (ok, I admit this is my favorite gospel 🙂 ) I was struck anew how little Yeshua emphasized Himself and He – being the Father’s Son, that’s saying something! He instead kept “throwing” everyone’s gaze back to His Father, giving Him credit for…everything. Forgive us for the wrongs we have done, as we forgive those who have wronged us. The reminder of how we tend to participate in the larger picture. We as a whole body. Then the request to keep us safe from the evil one. This is no coincidence in spoken order. Everything….everything God does has profound purpose! Everything Yeshua said, how He said it and in what order promotes the keeping of the Father’s name (character) holy. Its meant to teach us more about the character of God. So we know Him more. This is the soul purpose of His every word and deed; the motive of Yeshua’s heart. His complete, undelayed obedience to the Voice of the Father who led Him in all He did. 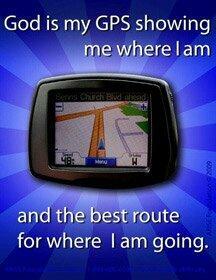 The Father really is/was His GPS unit (God’s Perfect Salvation). Though way more reliable and trustworthy than any satellite operated device by far. One could say we come with such a GPS as a standard feature. Its the evil one’s intention to disrupt and convolute this GPS with temptations hard wired into the rest of our “mother-boards”. It’s God’s intention to bring us home through testing and proving this GPS units trustworthiness as we listen more intently to Him. For those who have used the man-made version of a GPS, you know this device only gives you the next step in the route verbatim. Not every step all at once. Thankfully :-). How nice of God to make sure even this device would reflect His ways; though it’s doubtful the “designers” were aware of it. This God-given gift is held by the hands of the Spirit. The “signal” is kept strong through Yeshua. Nothing can separate us from Him! The signal can never be severed, only the directives ignored. Make no mistake the Father’s will is being done and He is intend on guiding us home! There’s a power hinted at here and in other passages…connected to forgiveness and prayer. Connected too, to the giving of the Holy Spirit. “Shalom aleikhem! (peace be upon you) Yeshua repeated. “Just as the Father sent me, I Myself am also sending you.” Having said this, He breathed on them and said to them, “Receive the Ruach HaKodesh! (Holy Spirit)” If you forgive someone’s sins, their sin’s are forgiven; if you hold them, they are held. For I have not spoken on My own initiative, but the Father who sent Me has given Me a command, namely what to say and how to say it. And I know that His command is eternal life. So what I say is simply what the Father has told Me to say. ** See also John 14:8-26…this includes much about the “operating system” of the Holy Spirit. > We say the we’s and our’s for a powerful reason in this prayer. Even if we don’t fully comprehend it, it was given us to say as it is, and we must obey. Trusting the Father and His knowledge of that which He gives. Respect it, its no small thing. > Also with the emphasis on the Father, the YOUR Kingdom, YOUR will, YOUR Name (character). A reminder of who’s who, and what we are really for. A glory that has never, will never, can never be ours, but His and His alone. > A focus on the order of all things Yeshua says, asking Him why…desiring the purpose behind each thing He said or did; for the purpose of knowing the Father more, not our significance. This comes in a totally different dimension than “getting to know God”. We desire to know Him…just to know Him. Yeshua never emphasized himself but gave all credit to his Father, without he could do nothing. Yeshua never claimed to be God nor did teh father ever say ti was Him who was on earth. No it was a man of flesh and blood who really died (while God can not die). Yeshua always took the time to pray to his Father and learned the people around him to pray to his Father, and not to him. In the time of agony Yeshua dared to call on his beloved Father? The One and Only God, after Yeshua’s death, made the son of man higher than the angels and took him at His right hand to become mediator between God and man. The outcome of the war has already been won…by taking it OUT of our hands. The battle belongs to the Lord. The out come of words? Depends on Whose counsel you refer to. Made up of a “committee of man”…the out come is sure to disappoint. Thanks for your comment and stopping by.